Why is Content Marketing Important? Content marketing is a big buzzword these days. While it’s taken over many industries, healthcare has been slower to catch on. It’s finally starting to make headway, and soon orthopedic surgeons that don’t deploy content marketing will be left behind. In this day and age, your patients are being bombarded by medical information online. They turn to websites like WebMD or online forums to self-diagnose their ailments. While these resources can be helpful, often they do more harm than good. Your online content–a digital medical library, so to speak–is a much better place for your patients to learn about their health. What is content marketing, exactly? We don’t know if we can say it better, but we can tailor it better to you and your practice. Content marketing involves publishing and sharing online content (blog posts, emails, YouTube videos, or social media posts). Expert content sets you up as a thought leader in your field. It helps you develop a level of trust with potential patients. As they read your content, they are assured that you provide the very best care. Consistently updating your website with fresh content improves your Google or Bing rankings. The better your search engine rankings, the more likely patients are to find you in an online search. One easy way to get content on your site is to create a page for every condition you treat and every procedure you provide. When people find you online and read your content, they give you something valuable in return: their time. The more often they read your content, the more likely they will be to visit your practice. Content marketing differs from traditional marketing. Instead of advertising a few times in the paper, on a TV commercial, yellow pages, or on a billboard, really good content marketing requires an ongoing commitment. You have to create a strategy and then stick to that strategy for it to work. Consumers–your patients–have gotten pretty good at tuning out advertising noise. They only see content they consider valuable, ignoring magazine and newspaper ads, billboards, yellow pages, and online advertising. With 80% of Americans searching online for medical information and 20% of those searching for a specific doctor, it’s more vital than ever for your content marketing to be up to par. Content marketing gives them what they’re looking for: valuable, helpful information that helps them feel comfortable coming into your office when they’re suffering symptoms of carpal tunnel or another condition you write content for. 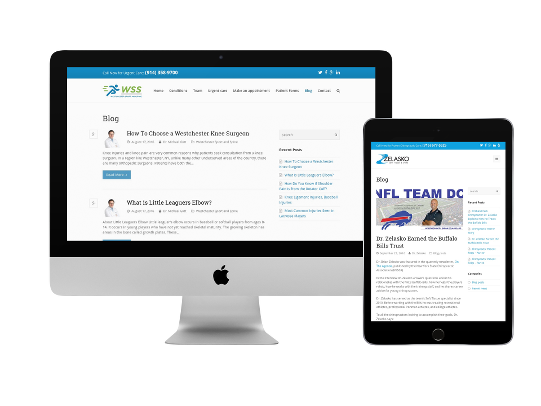 Adding content marketing to your overall marketing strategy helps your patient turn to you for medical information instead of to generic websites. Publishing regular articles on your website establishes you as an expert in your field. Regularly updating your website’s content increases your Google rankings which means more people are exposed to your practice. WANT YOUR PRACTICE TO PUBLISH GREAT CONTENT? Your content marketing should be patient-centered. Before you come up with topics or choose the particular medium you’ll publish in, consider what your patients want and need. Sports medicine providers, for example, will need different types of content than pediatricians. Let’s take the sports medicine example. Say you are a sports medicine provider who specializes in treating amateur athletes, say patients in their 30s who run marathons or play tennis in their spare time. This group skims content on their smartphones while they wait for their coffee. They scroll through newsfeeds, glancing at articles that catch their attention and only click on the really grabbing ones. They have attention spans shorter than goldfish, and they’ll stay on a page for about 4 seconds unless it captures their interest. If you are trying to attract this audience, you’ll need to provide content that can be digested in short, manageable chunks. If you’re used to writing for medical journals, you’re going to have to rethink your writing style. Aim for an 8th grade reading level (you can check how difficult your writing is to read by running it through a website like this one). Brief informational videos, image-based content like infographics, or skimmable articles and emails will be your best bet. Each provider’s audience will be different, so take the time to understand yours. Keep in mind that your content should not sound like advertising. 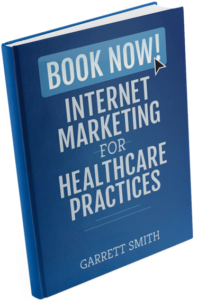 The best marketing content doesn’t necessarily talk about the great care patients will receive at your practice. You may be surprised to hear that patients are extremely interested in content such as staff bios. But you can be sure that they won’t take the time to read anything that sounds like an ad. Instead, they’ll be more drawn to informational content that helps them make decisions about their medical care. Your content will humanize your practice, help patients understand conditions and injuries, and put them at ease about visiting your office. Be careful also to avoid medical advice online unless you’ve checked with your lawyer. Even answering questions posted in the comments with medical advice can turn into a legal issue. Save that for an in office visit. What does valuable content look like for your patient? While each type of practice will have different types of content they should focus on, some might be how-to blog posts, short videos, informational emails about taking care of health, or helpful infographics. For example, a sports medicine provider could write a blog post about nine ways to exercise to prevent injury. He could send an informational email about the best exercise gear to wear for different types of exercise. Or he could post an infographic about how a certain injury occurs and how to prevent it. The key to consistency is planning ahead of time. One of the best ways to make sure you publish regularly is to create a monthly or quarterly content calendar to keep your content marketing on target. Your calendar can include social media posts, email blasts, blog posts, and other types of content you think your audience would find valuable. To start with, find a calendar that works for you. If you’re a paper and pen person, an old school desk calendar works just as well as online calendars. The WordPress Editorial Calendar plugin offers a more integrated approach, allowing you to draft articles directly on your calendar. Once you’ve found a good calendar, determine what your content marketing will look like. It may be helpful to craft a mission statement that defines what types of content you’ll publish and some of your goals. Goals that are attainable and measurable work well, like scheduling a certain number of appointments through your website per month. Next, brainstorm a list of topics. Google Keyword Planner is a great tool to help you come up with topics. For instance, the keywords “hand pain” generates other topics like “surgery carpal” and “symptoms carpal”. Some of those would have to be broken down into subtopics, but you could write a good blog post on different types of surgery to treat carpal tunnel or on common symptoms of carpal tunnel. Another way to brainstorm topics is to recall questions patients have asked in your office. Frequently asked question articles would be helpful to all your patients. Once they’re written, you can refer patients to your online articles to help answer their questions. After you’ve created a topic list, assign those topics a publish date on your content calendar. Remember to put seasonal or holiday-related topics in the appropriate months. Don’t overload yourself by trying to schedule a post every single day unless you’re sure you can do it. Writing thorough blog posts is hard work and may take more time than you have. Start off by scheduling posts once a week or even once a month. If you have more time, you can always ramp up the number of posts you publish later. Content marketing is here to stay in healthcare. Your customers are looking for you online. Thirty-five percent of service-related searches online are for health services. And if you aren’t showing up in their Google searches, you can be sure another healthcare provider is. Your content marketing strategy could be the difference between finding new patients and expanding or losing patients and stagnating. The investment you make in online content will make a difference. What is a Patient Persona, and How can it Help Me? You’re Mobile. Your Patients Are. Why Isn’t Your Website? Follow us on all of our social media accounts to stay up to date on the latest practice marketing news, tips and updates. Get Your Three Free Chapters Now! Fill out the form below to download each chapter. Fill out the form below to see if you qualify for a free practice marketing assessment and action plan. Enter your professional and practice name, if different. Enter your specific practice area. Leave blank if you do not have one. Pick three general searches phrases and two specific treatments. So we know where to send the checkup report! So we can get a hold of you when we have our results! Once we launch your website, we will begin charging $399 / mo. + $49 / mo. per additional location.